A craftsman that helped create murals at a childrens museum in Halifax explains why he gave gave up his job as a lecturer to focus on his passion for the craft of glass sign making. 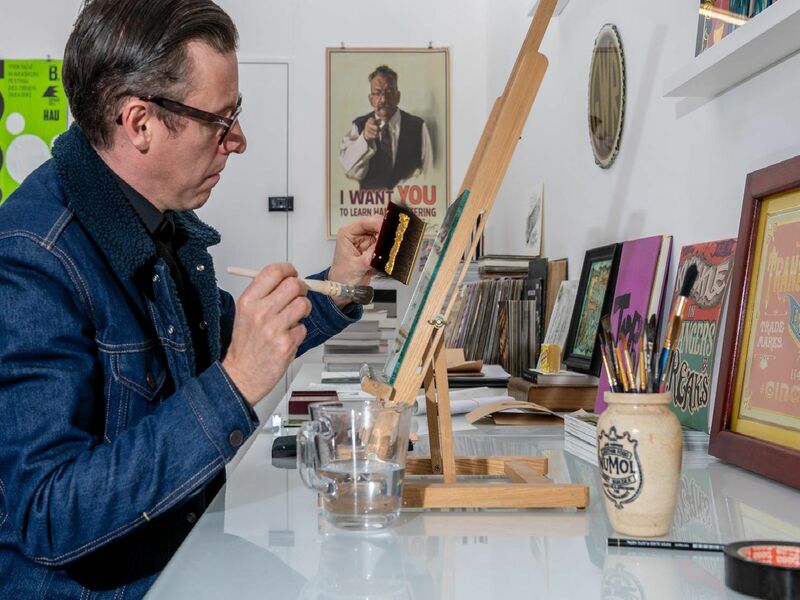 From his studio, part of the impressive Bates Mill complex, Robert Walker runs his own business – Signs by Umberto – which specialises in traditional sign writing and reverse glass sign making. The name, as he explains, has a family connection. Umberto was a name my father gave to me at a young age. He has a nickname for each of his four sons that all come from films or TV programmes. So when he set up his signwriting business it was a little nod to his father. My dad still calls me Umberto, as does my mum, so it felt like the right choice to call my business Signs by Umberto, he says. Though Roberts one-man business has only been going for a couple of years, his passion for signwriting is etched far deeper. He grew up in Shelf, near Halifax, and as a teenager did his school work experience with a signwriter called Brian Scargill in Bradford, helping him work on murals at the Eureka Museum.